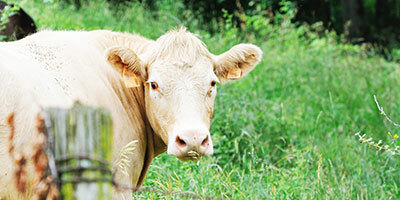 Magnesium (Mg) is an essential mineral for dairy cattle. Many forages are deficient and excessive amounts of other minerals, especially potassium (K), can interfere with Mg utilization, resulting in a greater Mg deficiency. While grains and oilseeds contain more Mg than most forages, the total ration still can be deficient. Most dairy nutritionists recommend 0.35% Mg in the total ration. Since typical unsupplemented rations contain 0.20 to 0.25% Mg, they should be supplemented with 0.10 to 0.15% Mg. This is equivalent to 0.18% to 0.28% of MAGOX® 54% or 3.6 to 5.6 lb MAGOX per ton. This small amount should be added in the form of a mineral premix or supplement to assure adequate mixing and distribution. Many of today's high concentrate dairy rations contain inadequate amounts of fiber to stimulate the rumen and adequate saliva secretion, with its natural buffers. Also, some rations contain high amounts of corn silage or other wet or acidic ingredients. In these situations, supplemental buffers are needed for optimum rumen function and milk production. While carbonates are very effective buffers, feeding MAGOX® in combination with bicarb can further improve buffer performance, according to recent research studies. A two year university study compared MAGOX alone, Sodium Bicarbonate alone and a combination of the two in early to mid-lactation cows. The combination buffer with MAGOX was more effective than either single buffer fed alone as shown below. Erdman, R.A., et al. 1980. J. Dairy Sci. 63:923. Erdman, R.A., et al 1982. J. Dairy Sci. 65:712. How Much MAGOX is Needed for Buffering? The above trials utilized 0.8% MgO in the total ration or about 0.35 lb/day. Other researchers summarized 19 feeding trials that used from 0.1 to 0.4 lb/day. They concluded that the greatest increase in milk fat percentage occurred in cows fed 0.3 lb/day. Premier recommends the following amounts of MAGOX for dairy buffers. MgO for use as an antacid or buffer should be quickly soluble in order to neutralize excess acidity resulting from rapid fermentation of high concentrate rations in the rumen. There are large differences in the rate of rumen solubility of feed grade MgO sources (See MAGOX Bioavailability here next month). Tests show that MAGOX is more readily soluble than other feed grade magnesium oxides and more soluble than dolomitic limestone. MAGOX is quickly soluble in the rumen, compared to other MgO, and is preferred for use in dairy buffers.